So what’s wrong with the screen above? 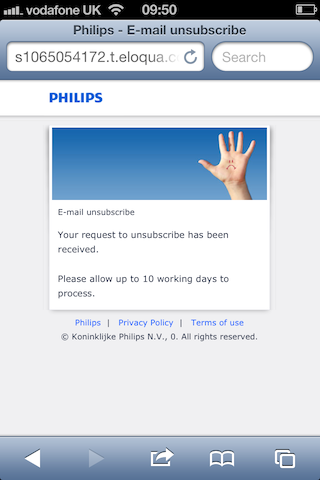 Well, it’s not great that it looks like it’ll take 10 days to actually get off the company’s mailing list but the main thing for me is that this is a big missed opportunity to find out why you’ve asked not to be contacted by email any more. With the data gathered from the example above Debenhams can learn a number of things and note which option is first on the list! It’s really tempting as a marketer who believes in their brand to want to email your subscribers as often as possible, but if a significant volume of your unsubscribers tell you that you’re emailing them too often, then that’s something valuable to know. 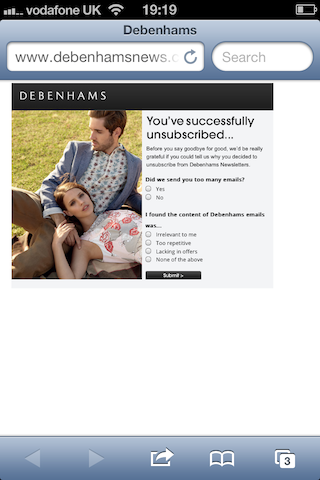 With the second set of questions Debenhams can use this information to improve the content of their newsletters in the future. By over-laying information about who unsubscribes with why they unsubscribe there’s a real opportunity to improve the effectiveness of your emails to remaining (and new) subscribers. Under normal circumstances the number (or percentage of) unsubscribes over a given period can be perceived as a negative metric to measure. However, if marketers can use the opportunity to gain valuable insight to improve their eCRM strategy they might not be such a bad thing after all!